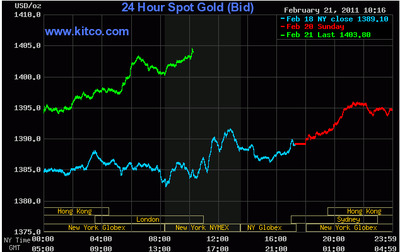 The thing is, even if the stock market were open today, we’d probably be just talking about what’s happening in the oil, silver, and gold markets, so it’s really like nothing has changed one bit due to the holiday. All three commodities are ripping face today. 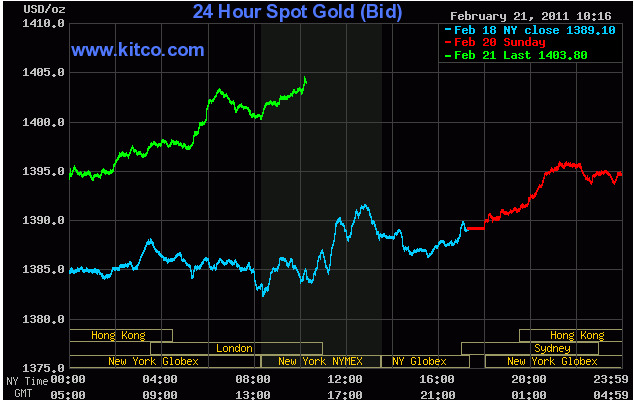 Crude is zooming back towards $90, gold has broken back above $1400 to $1404, and silver — silver! — is closing in on $34. Just last night it broke $33. And it’s in large part due to the events transpiring in Libya, which is really the first serious oil producer that’s likely to go down. There are already reports, totally unverified, that Gaddafi has left the building.